Weather Update: According to Weather.com the weather is supposed to clear in time for our Canoeing! It's Summer! Come enjoy the season with your fellow MIT alums by canoeing down the Brandywine River! Following the canoe ride, satiate your hunger with an outdoor-grill lunch, and socialize with your fellow alums. We'll be meeting at the office of the Northbrook Canoe Company where they will transport us to our drop-off location. They will provide all supplies including canoes, paddles, and life jackets. The trip along the river will last approximately 2.5 hours, and include one portage where we'll need to carry our canoes around a small damn. The river is mostly calm with only light rapids, and the scenery is outstanding: peaceful, bucolic, and with trees that stretch across the river to create a verdant, often shaded journey. At the end of our soul-refreshing voyage we'll be back at the Northbrook office where lunch will be served outdoors. Hot off the grill will be your choice of hamburger, veggie burger, or hot dog, served with fries and your choice of an assortment of drinks (sodas, Gatorade, water, iced-tea). For dessert there will yummy ice-cream sandwiches. The burgers can be had with or without cheese. Please indicate your food preference when you sign up. 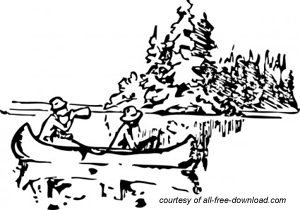 Since the water is only a few inches deep in some locations, the general advice is to limit canoe weight to approximately 400 pounds to reduce the chances of grounding. Thus in most cases, there will be two people per canoe. However, if desired, a third person can ride in the center on the floor of the canoe. This is a family friendly event and children are more than welcome. However, Northbrook Canoe specifies that no child under the age of two will be permitted. Further, there must be at least one person of ten years of age or older for every person less than ten years of age in every canoe. It is essential to arrive before 11:00 AM. It's imperative that everyone make it to the office by this time since the vans taking us to our drop-off location will leave shortly afterwards, and we will not be able to wait for any late-comers. Lunch will be served at approximately 2:30 PM. However, we encourage you to bring something to drink during your trip, and snacks may also be brought if desired (following the guidelines in the FAQ).